Gettin’ To Know… Levi Hummon: The songwriter talks to us at C2C about Songs We Sang, his mother’s charity and much more! His father is a famous songwriter, his mum is a rock star, and he’s born and raised in Nashville. That’s Levi Hummon. Levi and his father, Marcus, were the stars of CMA Songwriters Series tour back in October. 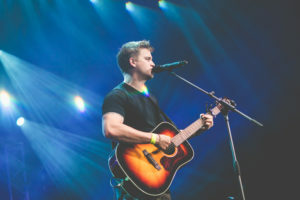 This year, apart from playing in front of huge crowds at the Country 2 Country Festival, fans had a chance to catch him during Kristian Bush’s tour where he was the opening act. We caught up with him to not only discuss his brand new song, Songs We Sang, but also his mum’s amazing charity, Thistle Farm, that helps women recover from drug abuse and prostitution. You were here only a few months back, how was your first ever UK experience? We were here in September/October for CMA Songwriters Series. I was actually here with my dad! I honestly did not know how it’s gonna go but I feel like the British fans and the London fans are super receptive to lyrics and songs, so I immediately thought I had a fan base by the end of the weekend. It was amazing. I was so excited to come back and see if it was a real thing. I did actually have fans that knew the words to my songs now. Even today, there were people singing my songs – that was awesome! Ah, that’s who was singing. I thought I heard something! Not only you played in the UK, but you managed to go over to Europe too, are these kind of singer/songwriter tours something you enjoy? (Laughs) they have movies though…. Yeah, they’ve got movies but some of my sarcastic jokes people where like, “oh, he really means that.” (laughs) Musically, I think everybody was listening. American audiences can get over-saturated because they are used to so much music but here it’s like, “oh, it’s an American accent” and they are excited. It feels like they are more attentive to some of the songs and they’re more about the lyrical content. You toured with your dad too, it was so great to see you both, what does it mean to you to be able to do that? You know, it’s like the most special. A lot of fathers don’t get to share that and it’s really special. It’s a way we connect and bond but he’s also a creative mentor for me, not just my dad. I always learn a lot from him and if I have any talent whatsoever, it is from him. How much influence did you get from your parents, were they pushing you towards music from the beginning? My parents have always been very supportive. I’ve always been creative but I kind of expressed it through visual arts – painting and sculpture. Music was just kind of in my DNA and eventually, it took over. My dad calls it a bug, like it’s a sickness (laughs). So, I have the sickness! My mum, she, in herself and in her on right, is a rock star. She’s really an amazing woman. She’s a preacher but she started an organisation called Thistle Farm and it helps women with a history of drug abuse and prostitution get off the streets and it’s amazing. I’m an artist, my dad is a songwriter and my mum is a rock star in my family. You just released a new song, Songs We Sang, can you tell us about it? It’s actually one of my favourite songs. It’s fun to sing and it’s really honest. Every lyric is talking about my hometown, growing up and walking through the streets – walking through Nashville because that’s my hometown. The song itself is about reaching back in time. If you think about high school or university, you don’t remember a lot of stuff but if you put on a song you listened to in high school, you probably know all the words. That’s what the song is about. Was it a co-incidence that it was released while you are in the UK or were you planning that? No, no, it was very planned out. I released Stupid, my old single, when I was here last time so I wanted to do the same thing because it worked out super well. What are your plans for the rest of the year, do you have anymore music coming out? Yeah, it’s whatever (laughs). One thing about being in the UK longer is that I get adjusted to the time zone which will be fun… So, I just released a single, we have a bunch of touring stuff that will come out in the summer and we will probably be putting out more music soon. I’m literally working on it as we speak. I’m working on it super hard. Morgan Evans: We chat to the Australian star about country in the UK, being married to Kelsea Ballerini and new music!